These are lyrics by John Denver that we think are kind of repetitive. 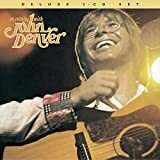 John Denver's, "Life is so Good"
It's a cute little song, but in 2 minutes, he only uses 7 words, in one of these four combinations. It can get a little more than annoying.